An American woman has been promoted to four-star general - the first female to reach the US Army's highest rank. In her acceptance speech, Ann E Dunwoody said she had never expected to rise so high in the ranks in her 33-year career. She said no-one was more surprised than she and her husband. "Behind every successful woman there's an astonished man," she added. There are 21 female generals, most of them one-star, in the US Army. Women make up 14% of the army's active service strength of more than 500,000 soldiers. Gen Dunwoody comes from a long line of soldiers. "A Dunwoody has fought in every American war since the Revolution," said army chief-of-staff Gen George Casey. 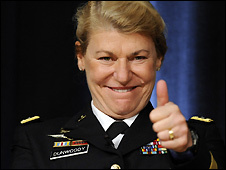 Gen Dunwoody is married to retired air force officer Craig Brotchie. "There is no-one more surprised than I, except of course, my husband," she told an auditorium packed with the military's top brass. "And you know what they say, behind every successful woman there's an astonished man." Defence Secretary Robert Gates said: "History will no doubt take note of [Dunwoody's] achievement in breaking through this final 'brass ceiling' to pin on this fourth star. "But she would rather be known and remembered first and foremost as a US Army soldier." She is now head of the Army Materiel Command, in charge of weapons, equipment and uniforms for the army. Women are barred from combat roles but have been allowed in the past two decades to serve in a wide variety of other positions. "It's been my experience in my 33 years in the military that the doors have continued to open and the opportunities have continued to expand," she said.